Welcome to the local campus of the School for the Better Making of Men. In this university transformation, growth and reaching potential are the core curriculum. In this university the standards of education include civic duty, leadership and servitude. Though it has no formal walls or formal halls, this university has weathered the trials and tribulations of this world and has stood for 106 years. From its hallowed halls men of leadership, grit and spirit have been birthed. Men like W.E.B. Dubois, Fredrick Douglas, Cornell West, Andrew Young, John Johnson and Dr. Martin L. King, Jr. walked the halls of this school and learned the tenants of Mainly Deeds, Scholarship and Love for All Mankind. This is the university of Alpha Phi Alpha Fraternity, Inc. The Founders of Alpha Phi Alpha Fraternity, Inc. were no ordinary achievers. Given racial attitudes in 1906, their accomplishments were monumental. As founder Henry Arthur Callis euphemistically stated — because the half-dozen African American students at Cornell University during the school year 1904-05 did not return to campus the following year, the incoming students in 1905-06, in founding Alpha Phi Alpha, were determined to bind themselves together to ensure that each would survive in the racially hostile environment. In coming together with this simple act, they preceded by decades the emergence of such on-campus programs as Affirmative Action and Upward Bound. The students set outstanding examples of Scholarship, Leadership and Tenacity — preceding the efforts even of the NAACP and similar civil rights organizations. These examples and this spirit of brotherhood would birth chapters of the Fraternity at campuses all over the United States at both historically black colleges and universities as well as traditional. As part of the evolution of the Fraternity, Alpha Phi Alpha began to develop alumni chapters to continue the fraternal and servant spirit long after graduation from college. The third oldest alumni chapter of Alpha Phi Alpha is located here in Detroit. 293 Eliot is where the local alumni chapter of the House of Alpha exists. Built in 1919 and chartered in 1922 Gamma Lambda has stood for the last 90 years as one of the lights of servitude, leadership and brotherhood in Detroit. Many of Alpha Phi Alpha’s national programs have been provided by the men of this particular house. Voter education and registration through “A Vote-less People is a Hopeless People”, “Go-to-High-School, Go-to-College” program, which concentrates on the importance of completing secondary and collegiate education as a road to advancement, “Project Alpha which is designed to provide education, motivation and skill-building on issues of responsibility, relationships, teen pregnancy and sexually transmitted diseases for young males ages 12-15 years and other programs have been implemented to support the people of this community. Gamma Lambda has also in accordance with the National Fraternity partnered with Big Brothers/Big Sisters, the March of Dimes and locally Meals on Wheels. “Our national programs hit at the core of some our community’s needed areas. Project Alpha, connects young men to older professional male role models. Go To High School Go To College, stresses the importance of education and more importantly higher education. Vote-less People is a Hopeless people works to impress on us all the importance of our involvement in the political process to insure that our voices are heard. Brothers’ Keeper creates families outside of natural families for lasting friendship and assistance for our elderly,” says Burke Gaddis, President Gamma Lambda, Alpha Phi Alpha Fraternity, Inc.
Much like the national Fraternity there has been many men of note who have counted Gamma Lambda has their home: Former Mayor of Detroit, Dennis Archer, William Pickard, entrepreneur, the Honorable Craig Strong – 3rd District Court, Federal Judge, the Honorable Damon Keith, and now the president-elect of the National Fraternity of Alpha Phi Alpha, Mark Tillman. “When you consider the large number of men who belong to undergraduate and alumni chapters throughout the country, it is remarkable we can benefit from the hard work, energy and contributions that earned Mark the respect of his peers to become the next general president,” said Former Mayor Dennis Archer, Alpha Upsilon, 1963. “Also when you consider some of the outstanding members who have left their mark on Gamma Lambda it is wonderful to see Mark’s success. Gamma Lambda’s Education Foundation has work tirelessly for years providing thousands of dollars to young men through scholarships for the college or university of their choice. Additionally Gamma Lambda’s Alpha Esquires in recent years brought the National Fraternity’s mission of developing leaders, promoting brotherhood and academic excellence to our youth. Through Alpha Esquires, young men learn many of the rites and characteristics of manhood. From the simplest act of learning to tie a tie to job interviewing and financial literacy, the mentors of Alpha Esquires work to shape the young men of tomorrow. Most recently, Gamma Lambda has created the GLCDC (Gamma Lambda Community Development Corporation) designed to strengthen at-risk families, and work to prevent the cycle of poverty. There is a place where good men are made to be better men. There is a place where the rites and rituals of manhood are still practiced and passed down. There is a place where the spirit of servant-leadership still exists and is practiced. It can be found in not just within the confines of a house on Eliot but in the hearts and minds of the men who rest there. That spirit comprises the hearts and minds of those men who very proudly wear the letters of the oldest Black Greek Fraternity in this world. A fraternity whose campus is now worldwide but still impacts those on the grass roots level. 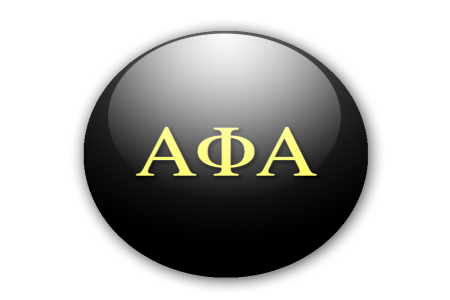 Since December 4th 1906…Manly Deeds…Scholarship…Love for All Mankind…This is the core curriculum of the University of Alpha Phi Alpha Fraternity, Inc.